Show off and stand out anywhere and everywhere with a durable teardrop flag. Teardrop flags are powerful advertising tools for big events, new store openings, and political campaigns. This popular marketing material instantly stands out in a high traffic outdoor area such as a major road or walkways to popular venues. Whether you’re a real estate agent, an event organizer, or a political campaign planner, you can utilize the durable and distinct result of teardrop flag printing. Your teardrop sign is printed on incredibly durable 4 oz. polyester fabric. This material is best showcased outdoors, as it is able to resist the strongest winds. You can advertise your sporting goods or your nearby business at the beach or along a ski trail. The fabric is also lightweight, making it easy to carry around and setup. The teardrop flag comes assembled in a bag. A replacement flag is also included in the order in case of an emergency. Choose from two sizes that instantly distinguish your feather flags. 9’ (32.54" x 78.64" flag) is the medium size for a teardrop flag banner. Best viewed from a walkable or relatively close distance. Tip: Line a row of medium sized teardrop flags along a road or pathway that leads up to your store. 11.2’ (40.38" x 101.63" flag) is the tallest and largest size available. It is easily viewed even from afar, making it ideal for campaigns planning to advertise in different outdoor areas. We offer a wide selection of base attachments that keep your custom teardrop banners secure in both indoor and outdoor locations. Opt for an attachment or a combination of two attachments that will stay on the ground the flag will stand on. 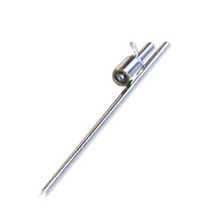 Ground Spike - Best for outdoor use, particularly for locations that have sand and grass. Cross Base - The go-to choice for teardrop flags displayed indoors. Cross Base and Water Weight Bag - This combination keeps your teardrop flag stable in indoor and outdoor locations. The water weight bag improves the stability of the cross bases. Ground Spike and Cross Base - The addition of the ground spike allows you to display the feather flag outdoors. Perfect for a flag that needs to be grounded on outdoor areas with grass or sand. Square Base stabilizes the flag for indoor use. Recommended for a teardrop flag that will be displayed on a flat surface. Connect the two smallest poles by sliding them into one another. The pole with a small knob is the top pole. Attach the medium-sized pole and connect it to the other two poles you’ve just attached. Slide the connected poles into the flag’s bottom pocket. After this, slide it more to the top of the flag. Place the connected pole and flag on the base. Look for the loop found at the bottom of the flag and the bungee cord on the bottom pole. Thread the cord into the loop. Thread the bungee cord into the pole’s metal ring. Tightly tie the knot and bungee so that the flag is attached securely to the pole. From quick assembly to a wide variety of stabilizing parts, PrintPlace’s teardrop flag printing options allow you to create marketing displays that easily stand out. Upload your design today or use one of our layout templates to guide you through the process. How should I wash the teardrop flag? Follow these washing methods to prevent the colors from fading. Use only cold water and mild detergent for all washing methods listed here. Teardrop flags can be machine washed and then tumble dried on low heat or hung out to dry on a line. Alternatively, larger sized flags that cannot fit in a washing machine can be hand washed then hung out to dry. You can also hang and clean the flag with a soapy brush then rinse with a hose before hanging to dry on a line. Note: If drying causes wrinkles, iron the teardrop flag on a low heat setting. Does the printing turnaround include the delivery of the order? The printing turnaround indicates how long it takes to produce your business flyers. You can choose from 1 to 5 business days for printing your flags. Our free file check option lets you check the design before we proceed to printing. What attachments come with the teardrop flag order? Every order comes with a teardrop flag and your selected base attachment. 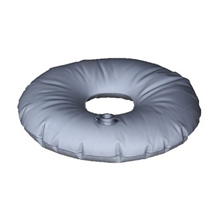 All accessories that come with the base attachment are included as well. You can also order a replacement teardrop flag on our online calculator. If you include a carrying bag to your order, everything will be organized in it for easy transport and storage. 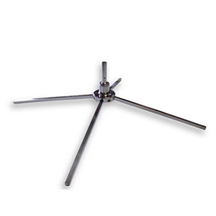 Cross Base Steel: attachment used for support on solid surfaces such as cement. Use our teardrop flags layout templates so designs are sized and formatted correctly. PrintPlace layout templates can be downloaded for each size below. 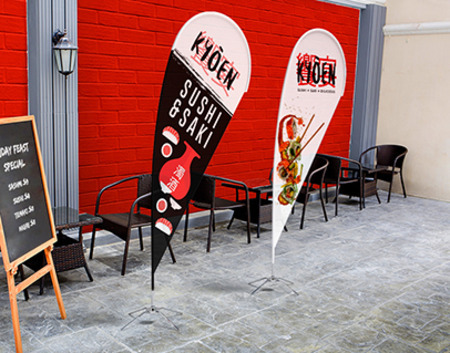 Teardrop flags are one of the most popular advertising tools for a reason. They can be placed along busy areas for instant and sustained exposure. But the design has to be memorable such that potential customers can recall the important details. Always use high resolution images and visual elements. It shouldn’t appear pixelated or blurred up close or from afar. Keep the focus on images and typography. Lengthy text can’t be read from a distance. Consider how it will be viewed if you decide to use one or both sides. You can opt to have the same design or play around with two separate looks.